﻿Somewhat past noon we encountered a second river, running broad and shallow over a bed of white pebbles, faintly smoking in the frigid air. We crossed it easily and parked up on the far side and brewed tea, black with the last of the sugar stirred into it, and ate a scant lunch of shrivelled bearberries picked along the river’s edge. Sunlight sparkled on the water and on the far bank a Siberian larch clothed in flame-red leaves flared in the sombre shade of conifers. The sheltering hush of the forest was broken only by the rippling rush of the river and the creak of trees pinched by cold and the occasional soft slide of snow from an overloaded bough. It was as if we were the first or last people in the world. 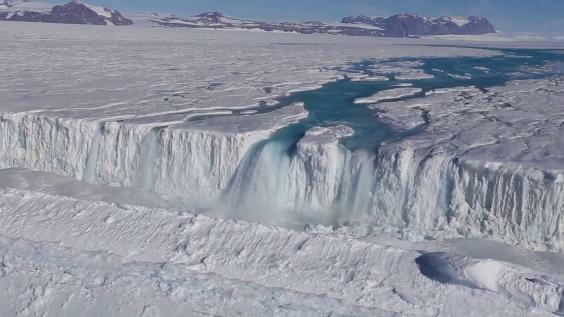 A new survey has shown that there are already plenty of rivers in Antarctica. In summer, bare mountain slopes and stretches of blue ice absorb sunlight's heat and feed seasonal drainage systems that cut through ice and run to the high margins of the coast, and plunge to floating ice shelves. As Antarctica grows ever warmer it's likely that these outflows of meltwater will increase in extent, perhaps accelerating loss of ice shelves that presently protect the outflows of glaciers from intrusion of warmer ocean currents. Meltwater melting more ice and creating more meltwater, a positive feedback loop. Seasonal streams becoming permanent, running across bedrock exposed by retreating glaciers and depleted ice sheets. As usual, fiction about the future is anticipated by its present. John Szarkowski, Introduction to William Eggleston's Guide.